Sorry, text version only for the moment. Sept 1962, "World Clearing and You"
Congratulations to Veni Lin from Taiwan for achieving Power FSM status in 2007!! Veni was personally responsible for getting 160 people onto service within one year! She is playing for ELITE FSM this year and is on target ! Any Scientologist can make it to Power FSM and be awarded this year. In order to qualify, you must personally get 100 different people started on their first or next service in a one-year period. This period runs from December to December. Elite FSM is awarded for personally getting 1000 people onto a service in a one year period. * Extension courses - the public must send in their first lesson to be counted as started. * Any other courses, auditing and OT levels delivered by the Flag(R) Service Org or the Freewinds. Power and Elite FSM status are awarded by an International Executive at the live New Years Event in Los Angeles. Are YOU playing the Power FSM game this year? Melbourne OT Cherie Ceberano is playing the Power FSM game this year, and she has started sending people into her local org! Trevor Rosenburg, Sydney FSM, is playing the power FSM game this year. He has his first selectees on the board, and now is organising Dianetics Seminars in his local area. Auckland OT, Paul Maunder, is absolutely playing the Power FSM game this year and has already selected many into Auckland org. Melbourne Clear, Oisin Grogan is playing the power FSM game this year! He has his first selectees on the board and has very BIG plans for this year. Melbourne Clear, Greth Jekel is playing the Power FSM game and has his plans fully worked out and has started! Adelaide FSM Jeff Brown is playing the Power FSM game this year - he has moved to Darwin and will be selling 1000 books to new people across the Northern Territory this year and getting them started on the extension course! * Do you always run into the same sort of problem in your dissemination efforts? * Do you not know how to start FSM'ing, but would like to or feel that you should get started? fsmicanzo@scientology.net.au and you will get a standard answer that will give you clear direction to handle it. "Making sure that interested people get books is making sure that they will continue their interest... If you think you can interest a person in Scientology and yet avoid your responsibility in getting him or her to read books on the subject, you are wasting a tremendous amount of effort." (c) 2008 CSAUSInc. All Rights reserved. Grateful acknowledgment is made to L. Ron Hubbard Library for permission to reproduce selections from the copyrighted works of L. Ron Hubbard. SCIENTOLOGY, DIANETICS, LRH, The Bridge, Flag, DIVISION 6 SYMBOL, FREEWINDS, SAINT HILL, L. RON HUBBARD, SCIENTOLOGY SYMBOL, OT, HCO and Golden Era Productions are trademarks and service marks owned by the Religious Technology Center and are used with its permission. Services relating to Scientology religious philosophy are delivered throughout the world exclusively by licensees of the Church of Scientology International with the permission of Religious Technology Center, holder of the SCIENTOLOGY and DIANETICS trademarks. Scientologist is a collective membership mark designating members of the affiliated churches and missions of Scientology. hide it anymore. They've crossed over and abandoned anything spiritual and to hell with them. "Ye are the salt of the earth." "What good is salt if it looses its savor?" The writer of this piece had one narrrow point, and one narrowly missed point. It is true that the other churches that showed up lacked their own "tech". It is true that they believed they needed some sort of "tech" if they called in psychologists and psychiatrists. Now you can believe what you want about the evils or lack their of of the "psychs". While admitting that they actually do help people from time to time, I firmly beieve that the "psychs" have a definite dark side to their business. But that is not the issue, which brings us to the point narrowly missed ... the various other churches are supposed to be operating off of FAITH, and not "tech". They aren't really about anything if they have to bring in "psychs" and why any legitimate church would have anything to do with "psychs" is beyond me. They are supposed to be there to minister to physical needs, i.e., help the rescue workers, pass out food, do whatever ... AND to lay hands on the sick, pray for people, etc. Again, I don't see where the "psychs" come in as far as being brought there by other churches. A church without the manifestation of the Holy Spirit is like a mausoleum. What are you doing? Getting your stats up for the week? 1. Have you ever been to the Freewinds before? And if so, how many times. 2. Would you like more information about coming to the Freewinds right after our refit is complete? 3. Are you interested in coming? 4. Are there any of the conventions mentioned below that you are interested in attending? If so, please state which ones. © 2008 CSFSSO. All Rights Reserved. Freewinds, Freewinds logo, Flag, OT, LRH, Scientology and The Bridge are trademarks and service marks owned by Religious Technology Center and are used with its permission. Scientologist is a collective membership mark designating members of the affiliated churches and missions of Scientology. Services relating to Scientology religious philosophy are delivered throughout the world exclusively by licensees of the Church of Scientology International with the permission of Religious Technology Center, holder of the SCIENTOLOGY and DIANETICS trademarks. Freewinds Ship is registered in Panama. 118 North Fort Harrison Ave, Clearwater, FL 33755, USA. If you do not wish to receive further e-mails, click here <blocked::mailto:freewinds@freewinds.org?subject=Please remove me from your list> to unsubscribe. Lugano in Switzerland, which just completed their 3X Solo NOTs auditors target, now has everything fully named out to attain their 5X stage well before this year's Maiden Voyage Anniversary Cruise. Mid OT VII, Luciano Vaccani and OT VIII Compeltion, Ornella Rasulo are the major driving forces behind these advances. WHERE IS YOUR OT COMMITTEE AT IN THE SOLO NOTs AUDITORS TARGETS? THE TARGET DATE BY WHICH ALL OT® COMMITEES ARE TO COMPLETE THEIR 5X STAGE IS THE MAIDEN VOYAGE ANNIVERSARY 2008. This e-mail was sent to you by the Church of Scientology Flag Service Organization, 503 Cleveland Street, Clearwater, Florida 33755. If you do not wish to receive further e-mails click here to unsubscribe. © 2008 CSFSO. All Rights Reserved. Solo NOTs and OT are trademarks and service marks owned by Religious Technology Center and are used with its permission. Scientologist is a collective membership mark designating members of the affiliated churches and missions of Scientology. Services relating to Scientology religious philosophy are delivered throughout the world exclusively by licensees of the Church of Scientology International with the permission of Religious Technology Center, holder of the SCIENTOLOGY and DIANETICS trademarks. My name is April and I am trying to get data from all Scientologists for a special project that I am working on. Please fill out the following survey and send it back right away. It is very important I have this data whether you are interested in being on staff in a Scientology Organization or otherwise. 1) Have you ever been staff in a Scientology Organization? If so, which one? Which posts/area did you work in and approximately when? 2) What area or post do you wish you had held or would have liked to work in? 3) Which post (if ever on staff) were or are you most successful at? 4) If you are or ever were staff, what were your motivations for joining? 5) What Scientology activities are you involved in? 6) Are you and your spouse (if married) qualified to join the Sea Org? If not, why? 7) Are you interested in joining the Sea Org? 8 ) What questions do you have about being on staff or in the Sea Org? SEA ORG MEMBERS MAN THE MOST IMPORTANT CHURCHES OF SCIENTOLOGY—FROM THOSE DELIVERING THE HIGHEST LEVELS OF TRAINING, AUDITING AND THE OT® LEVELS, TO THOSE PROVIDING ALL ECCLESIASTICAL MANAGEMENT AND INTERNATIONAL DISSEMINATION. ©2008 CSFSO. All Rights Reserved. The Sea Org symbol, FLAG and Scientology are trademarks and service marks owned by Religious Technology Center and are used with its permission. SCIENTOLOGIST is a collective membership mark designating members of the affiliated churches and missions of Scientology. Wise is a trademark, service mark and collective membership work owned by World Institute of Scientology Enterprises and is used with its permission. Services relating to Scientology religious philosophy are delivered throughout the world exclusively by licensees of the Church of Scientology International with the permission of Religious Technology Center, holder of the SCIENTOLOGY and DIANETICS trademarks. If you listen to LRH lectures, please give us your input on this survey. Please click here to take the survey. Thank you very much for your support and participation. Your input is very valuable to us. 2. Who came to your mind as someone you want to select for Freewinds services? 3. Do you have any technical questions about any of the ship services? 4. Is there anything you need In order to get going on this? Right at this moment the Freewinds is being fully renovated in preparation for the delivery of OT IX & X. And when we open for services again those Scientologists who meet us on the dock board a brand-new Freewinds ship! While the renovations are moving forward full speed ahead aboard the Freewinds, a huge team of ship staff is available at Flag Land Base for the delivery of the Freewinds-only OT Debug service, New OT VIII and Basics courses!!! 1. For every 4 selectees who are selected and gotten arrived by an FSM and started on a Basics course within a period of 90 days, one Basics Course will be awarded to that FSM. 2. For every 4 selectees who are selected and gotten arrived by an FSM and started on the OT Debug Service within a period of 90 days, one OT Debug Service will be awarded to that FSM. 3. For every 6 selectees who are selected and gotten arrived by an FSM and started on a Basics Course within a period of 90 days, one Basics Course and one convention fee will be awarded to that FSM. 4. The following is awarded to the FSM in accommodations awards for having gotten the following number of public arrived within 90 days. Note: These funds can be used towards any type of cabin. Awards for one’s cabin does not include food. A reduced restaurant rate for FSMs is provided at $40 per awarded day, which includes 3 meals and 2 breaks. The amount needs to be paid to the Cashier upon arrival in cash and may not be debited from the FSM’s account. 1. For every 3 selectees gotten arrived by an FSM and started on a Basics Course, one Basics Course and a Convention fee will be awarded to that FSM. 2. For every 3 selectees gotten arrived by an FSM and started on the OT Debug Service, one OT Debug Service will be awarded to that FSM. Get going on this and send me your CSW for awards you now earned! I want to award you with lots of services and accommodations! 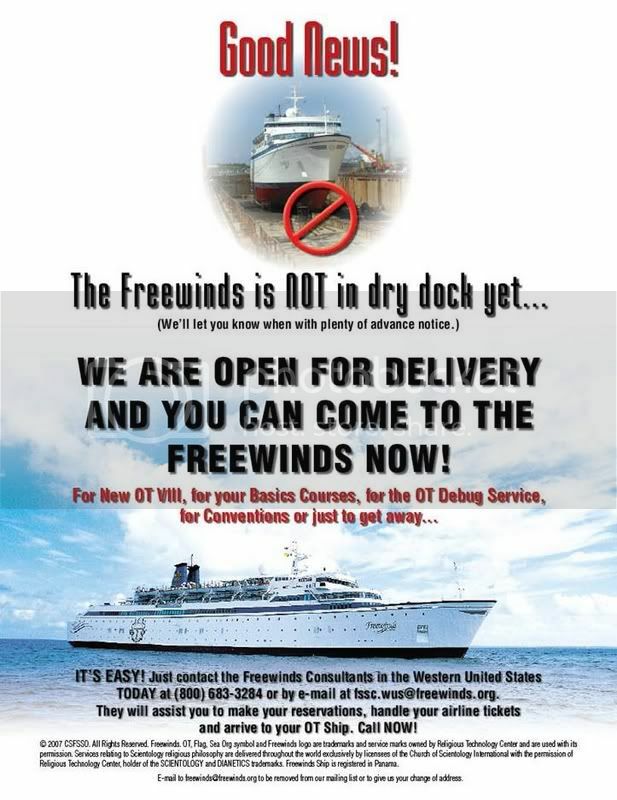 If you’d like to be removed from this mailing please let us know at: freewinds@freewinds.org. © 2008 CSFSSO. FLAG, FREEWINDS, OT, LRH, HCO and SCIENTOLOGY are trademarks and service marks owned by Religious Technology Center and are used with its permission. Services relating to Scientology religious philosophy are delivered throughout the world exclusively by licensees of the Church of Scientology with the permission of Religious Technology Center, holder of the Scientology and Dianetics trademarks. Scientologists is a collective membership mark designating members of the affiliated churches and missions of Scientology. Scientology is an applied religious philosophy. The Freewinds ship is registered in Panama. UPDATE ON 10,000 SCIENTOLOGISTS ON OR THROUGH SOLO NOTs TARGET! All OT Vs, OT VIIIs and Mid OT VIIs are requested to send in their biggest OT wins for use in future promotion. Write up OT® phenomena that you have experienced due to moving through the NOTs® band and send them via return email. © 2008 CSFSO. All Rights Reserved. NOTs, Solo NOTs and OT are trademarks and service marks owned by Religious Technology Center and are used with its permission. Scientologist is a collective membership mark designating members of the affiliated churches and missions of Scientology. Services relating to Scientology religious philosophy are delivered throughout the world exclusively by licensees of the Church of Scientology International with the permission of Religious Technology Center, holder of the SCIENTOLOGY and DIANETICS trademarks. Please read this briefing about a special opportunity created by the Top two Sea Org orgs in the world combining forces! What do you feel are the main benefits of advantages of taking Freewinds services while the Freewinds is at Flag? Are you familiar with the FSM games you can play and win for getting your selectees onto Freewinds services such as the OT Debug Service and Golden Age of Knowledge Basics Courses? Do you have any questions regarding how to take advantage of this opportunity? in a combined effort get you and your selectees to full OT at TOP speed. For a limited time only and starting from now through the end of April 2008, you and your selectees can experience the unique combination of the top 2 Technical Delivery & Sea Org Service Organizations on this planet – Flag and the Freewinds! The Freewinds is right at the moment “docked” at the Oak Cove building at the Flag Land Base in Clearwater, Florida. The entire Service Organization including all technical staff, auditors, supervisors, C/Ses, OT Debug Consultants, executives and your Freewinds MAAs are fully set up to deliver to you and your selectees while concurrently the Freewinds ship is being fully renovated and readied for the delivery of future OT levels! Not only that, but here at Flag the Commanding Officer FSSO, Sharron Weber, is delivering her world-famous seminars every single day throughout the months of March and April 2008 for free to help you and your selectees to increase your Bridge speed and to be more successful across all dynamics! Right now is the best time ever to send your selectees to Flag where they can combine Flag Case Cracking auditing, L-Rundowns & Flag-only special Rundowns with Freewinds training, OT Debug service and Freewinds-only seminars!! All you have to do is get your selectee arrived to the Flag Land Base and started on a Freewinds service. Your selectee is going to stay in one of the Flag hotels which gives you the commissions for the accommodations. Your selectee resigns for further Freewinds or Flag services, which speeds them further up The Bridge. This way you earn more commissions for services and accommodations then ever before. But it doesn’t stop here because our services continue on the ship with the grand opening in the first week of May 2008! So to start with, send me your line up of which selectees you are sending to experience Flag & Freewinds services together between now and the end of April! Austin has just attained their 8X Solo NOTs auditors figure! Further they have everything worked out to attain their 9X target by LRH's Birthday 2008 and their 10X level by this year's Maiden Voyage Anniversary! They are a trye group of OTs helping to drive their org through Ideal Org status and up to Saint Hill Size! It has taken constant create and work to attain these stages. The Austin OTs have consistently worked on getting their OTs to arrive and stay to get onto OT VI and VII. In fact there is not an OT Committee meeting held where this target is not taken up. VVVVVVVVVVWD to Ken and Yvonne Schick and the whole OT Committee team there in Texas! ALL OT COMMITTEES ARE WORKING ON INCREASING THE RANKS OF THEIR SOLO NOTS AUDITORS TO GET ENOUGH OT'S ON PLANET EARTH TO HANDLE IT! GET YOUR OT COMMITTEE TO COMPLETE THEIR NEXT SOLO NOTS AUDITOR TARGET NOW! © 2008 CSFSO. All Rights Reserved. Saint Hill, Solo NOTs and OT are trademarks and service marks owned by Religious Technology Center and are used with its permission. Scientologist is a collective membership mark designating members of the affiliated churches and missions of Scientology. Services relating to Scientology religious philosophy are delivered throughout the world exclusively by licensees of the Church of Scientology International with the permission of Religious Technology Center, holder of the SCIENTOLOGY and DIANETICS trademarks. “Wow! That was a book. Actually that was the book! I learned about myself, from the beginning of the book all the way to the end. Earlier I thought I wouldn’t understand this book, as this is too high for me. I remember my father was doing his PDC years ago (the lectures that go with this book) and I thought, ‘How I will I ever understand this data?’ And here I understood the book and the data in it! I actually think the book itself was life changing and my attitude toward life and auditing totally changed and went into a new range. A few weeks ago I improved my hearing and also my sight. A few weeks ago I passed my eyes test (without glasses still) but then went in session as an auditor. I felt my sight even more improved and I was able to see what was happening there with the PCs in session. Also, I can’t wait to go in session as a PC! I could see why we do objectives and other processes. This book was the Basics for me. Also studying the books in time sequence helped me to understand it. Thank you very much for everyone who helped to get these new books out, RTC, COB and LRH for the wonderful tech!” —A.N. ©2008 CSFSO. All Rights Reserved. FLAG is a trademark and service mark owned by Religious Technology Center and is used with its permission. Services relating to Scientology religious philosophy are delivered throughout the world exclusively by licensees of the Church of Scientology International with the permission of Religious Technology Center, holder of the SCIENTOLOGY and DIANETICS trademarks. YOU ARE THE NEXT ONE TO BE ONE OF THE 10,000 AUDITING ON SOLO NOTS! “Now, more than ever, it is time to get going and achieve cause over life. See a success below from those auditing on Solo NOTS. “Wow! I just finished the checksheet for OT VI Part B, and I’m SO EXCITED! What an education! I understand LIFE! Now, I get to use what I’ve learned, and it really has become 1,000 percent real to me that a person can indeed become Cause Over Life! “Not only that, I’ve had terrific case gains in my studies! I’ve changed viewpoints on things that would never change! “And it has been a HUGE win to be sitting for 11 hours a day with no real difficulty, since I started on OT VI Part A sitting in a wheel chair, struggling to get through 3 hours a day! I’m leaping up and down the stairs like a gazelle! And it’s better every day from READING THESE MATERIALS! If I can get these gains from reading, what in the world can happen when the application begins???!!!!! And I’m not talking about this body and it’ s challenges…I’m talking about the real deal, the thetan growing up! “I KNOW I CAN DO IT! “Thank you to-the-stars-and-back to the Supervisors, Word Clearer, and staff who have guided my journey! And to LRH, what a fabulous opportunity you’re giving us here, for the first time ever in all the gazillions of years we’ve been playing these games!” —K.B. ©2008 CSFSO. All Rights Reserved. FLAG, SOLO NOTS, OT and THE BRIDGE are trademarks and service marks owned by Religious Technology Center and are used with its permission. Services relating to Scientology religious philosophy are delivered throughout the world exclusively by licensees of the Church of Scientology International with the permission of Religious Technology Center, holder of the SCIENTOLOGY and DIANETICS trademarks. "The Freewinds is right at the moment “docked” at the Oak Cove building at the Flag Land Base in Clearwater, Florida. The entire Service Organization including all technical staff, auditors, supervisors, C/Ses, OT Debug Consultants, executives and your Freewinds MAAs are fully set up to deliver to you and your selectees while concurrently the Freewinds ship is being fully renovated and readied for the delivery of future OT levels!" they have been avoiding U.S. Territorial waters for quite some time. What has changed? Why are they daring to steer the "death winds"
Any chance David Miscavige made a strategic decision to spend the money to hire hugely (and I mean hugely) expensive professional asbestos removal contractors to "make it go right" this time? After all, the Freewinds is Davy's private get-away vehicle...as sort of ocean-going "DC-8." Breifly, the cult announced Freewinds Acadamy to deliver all previously Freewinds only services last year. They also announced that the SS Asbestosis was not in dry-dock, yet. They would announce when it wasw happening. They also announced deliverence of OT IX and X were soon to happen. The emails in my last post state that Freewinds is being renovated and it will be a "new" ship. But hey, its not as if the cult will lie to 'align' members for an 'apparency' to create a 'reality', is it? OH! Did someone whisper Super Power Building? DANG! Who said that about Sydney's Ideal Org and the 11.5 mil renovations? Talking of Freewinds (see this thread I posted earlier which was not a joke although done in a humorous way viewtopic.php?t=26365 ). A friend of the family had gone on a cruise over the last few weeks which included stops at the Islands of Aruba and Curaçao. I was kicking myself because he called our house from Curaçao and I missed the call. It would have been great if I had been able to tell him to get some close up photos of the Freewinds in drydock having it's revamp plus any slave labour than might have been working on it (with or without respiratory protection suits). Sadly I "missed the boat" on that one. "The Freewinds is right at the moment “docked” at the Oak Cove building at the Flag Land Base in Clearwater, Florida. The ship is docked in Clearwater, i.e. in a U.S. port? ... Am I misreading this? Are the saying this Oak Cove building is now a "ship"? 1) the ship itself, named "Freewinds"
2) the service org that operates on the ship called "Freewinds"
About once a year, Freewinds comes to Flag. That means that you can do courses at a Flag/Clearwater location (without flying to some strange island and paying outrageous prices for on-board accomodations) delivered by Freewinds staff who are "on dry land". Any wogs allowed on staff positions or allowed to just cruise? Public of any case/training level are often regged to go there for various courses such as "Route to Infinity", "Responsibility and the State of OT" etc. Also conferences are held on'Ethics' ( ), Intention/Postulates, and whatever else they can come up with. Execs from orgs are also called for staff-related conventions. Very successful FSMs get invited too to brown-nose, I mean hob-nob with Miscavige. I have heard of just a few public going on the Freewinds just to get married and have their honeymoon. External links are to the cults video's now hosted elsewhere. Two weeks ago, I sent you an LRH Quote video from the Basics, which I hope you got a chance to see. If not, let me know — as I now have two more awesome videos just prepared for you, which you can check out and share with any other Scientologists you know! With so much more on the horizon, there is no time to spare for every Scientologist to get onto and through the Basics — as they form the foundation upon which The Bridge to Total Freedom is built. The LRH Basics Books & Lectures form the fundamental knowledge of Scientology. This is the path of knowing how to know, unlocking the gates to your future eternity. The complete library of LRH Congress Lectures, all together as one package. When it comes to “being there with Ron,” there is nothing closer than hearing his Congress Lectures. The Ultimate Collection includes the Basics Books & Lectures and the Congress Lectures in one overall package, giving you the entire Golden Age of Knowledge library. The savings on this package is equivalent to getting 174 LRH lectures for free. For the first time ever, LRH’s beginning books are now also available in paperback and audiobook format. Each paperback book is designed to facilitate understanding and ease of reading—from the glossaries and indexes to the layout of the pages. This e-mail was sent by the Church of Scientology International, 6331 Hollywood Blvd, Los Angeles, CA 90028. Use this link to unsubscribe, or change your mailing preferences. I have no idea if this is real, but supposedly this is an aerial shot of the Freewinds docked at Bonaire posted on March 19,2008. Here is a map of Scientology in United States. Not really that many, but I said yuck when I saw it. Last edited by Desert Rain on Sun Mar 23, 2008 6:02 am, edited 2 times in total. Giggles wrote: I was just wondering how far a new person would have to go in scientology before they would be allowed to be on the ship? Any wogs allowed on staff positions or allowed to just cruise? Snow White answered most of your question. The other... no wogs allowed on staff or to cruise. The ship is entirely a "religious retreat".